"I think we're going to the Moon because it's in the nature of the human being to face challenges. It's by the nature of this deep inner soul. We're required to do these things just as salmon swim upstream." 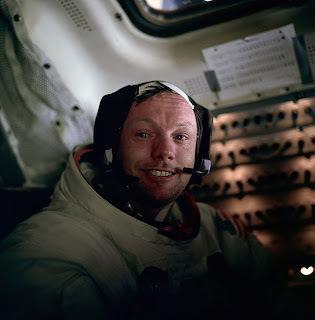 Astronaut Neil Armstrong, first man to walk on the moon, passed away today at the age of 82. NASA has published an excellent obituary and appreciation of his life. Since Armstrong's historic moon walk in 1969, only 11 other men have followed in his footsteps, most recently in 1972. I find myself saddened that we have not expanded our human presence in our solar system beyond Earth orbit in those 40 years. If the leadership we have acquired through our investment is allowed simply to fade away, other nations will surely step in where we have faltered. I do not believe that this would be in our best interests. The now to be cancelled Constellation program showed promise to fulfill lofty goals with a high level of safety and flexibility. Will the European Space Agency, or China or Russia eventually send humans back to the Moon or Mars or beyond even if NASA does not? I think we humans will land on Mars eventually, since as Armstrong stated almost 50 years ago, the challenge is in our nature. But when that does happen, Neil Armstrong will still have a permanent place in history as the first human to set foot on solid ground beyond the Earth. A "giant leap for mankind" indeed! Image: Neil Armstrong photographed by Buzz Aldrin after the completion of the Lunar EVA on the Apollo 11 flight, July 20, 1969. Body is mortal hopes and ambitions are not! Humanity shall witness one day what he envisioned and lived for.....my tributes!